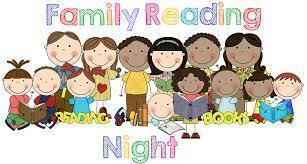 Please join us on Thursday, October 11th, from 5:30-6:30, in the Maple gym for Family Reading Night! Come join us for a night of family fun including books, snacks and gift card raffles! You may bring your own books to read or you may read some of ours! We hope to see you there!